This seems like a huge job- and well done. 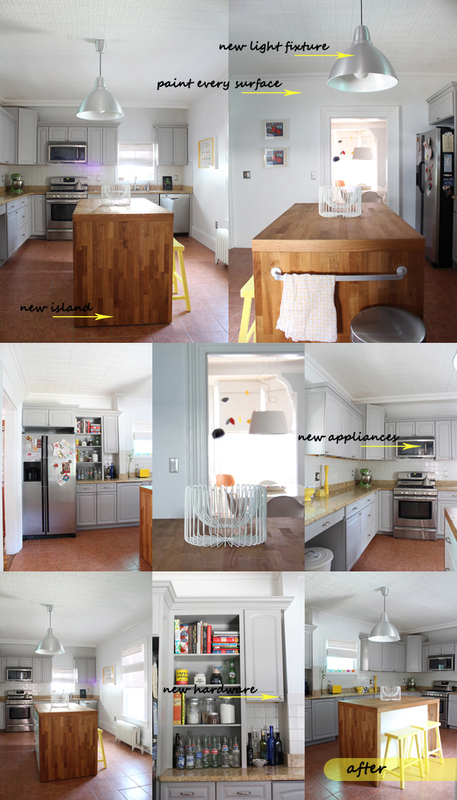 I really like the addition of the island and the cool yellow stools. Your kitchen looks excellent, lot of work, but it was well worth it. The feel is so much lighter, fresher and cleaner. rooth, Thank you! The island is from IKEA. They sold the wood countertop and sides as a set, we got it on sale when they discontinued the item. The cabinets are just regular lower cabinets from Ikea. Ada, Thanks! It really was a labor of love, at one point I was ready to throw in the towel but it was well worth it. Santa, Thank you so much! After painting everything white and grey we needed a splash of color, that's why I chose to paint the chairs yellow. Wow, Nina! Just wow! It really goes to show that you don't need a lot of money. You just need determination and hard work to turn drab into something beautiful. Great job. Looks great Nina! I love how you painted the cabinets instead of buying new ones. It's such a money saver and I keep telling people this! A new coat of paint can go such a long way. Great looking island too. I love the vertical wood. Theresa, Thank you! It was definitely hard work but so worth it. I've been playing with my new camera non stop and taking tons of pictures, it's so much fun! Wow! You really did take on a tremendous task but the results are amazing! You have managed to totally transform the space into a beautiful light, airy kitchen! The colour you chose for the cabinets are perfect! I am also crazy about the hanging pendant and the island! Congrats, it looks stunning! You did a great job! The new color and "small" adjustments make such a difference. You turned a dark and boring room in a airy living space! Absolutely awesome! I know what I'm talking about: I also painted our kitchen cabinets when we moved in. We just do not want to spent the money on a new built-in-kitchen until we finish some other stuff around here.